Under the general heading of Walking, this issue of Academic Quarter is dedicated to articles about literature, film and media, computer games, cultural history, migration, and aesthetics, which so to speak have reinvented the use of our legs in relation to one’s own and other people’s practices, and stage it as strolling, promenading, marching, flaneuring, sauntering, wandering, striding, idling about, ambling, loafing, and walking. 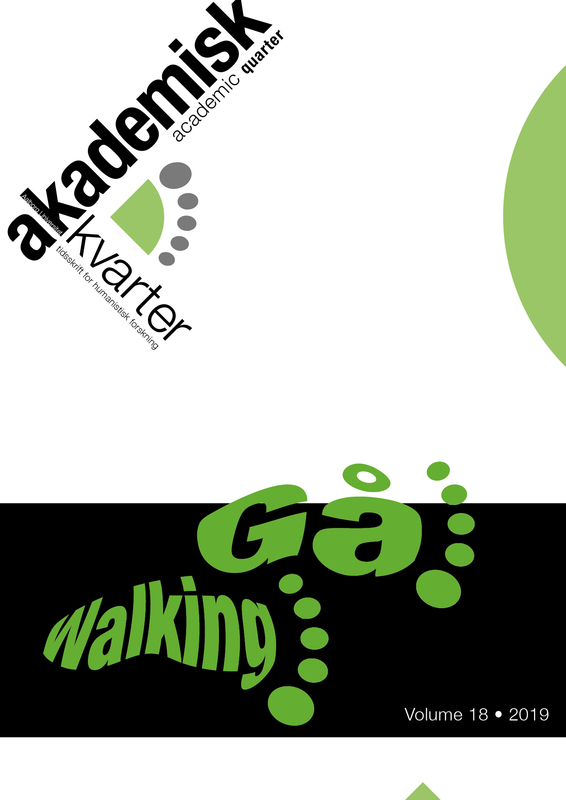 The first article addresses walking in the context of cultural history and considers the creative potentials of walking, and the articles in the issue are organized under the following section headings: Literature with “Det spadserende i 2010ernes Berlin-litteratur” and “The Poiesis of Charles Dickens's Night Walks”. Media with “From Wander to Wonder Walking – and ‘Walking-With’ – in Terrence Malick’s Contemplative Cinema”, “Walking in Two Directions at Once Locomotion Techniques in Virtual Environments” and Parodies of Christian Wandering in Luis Buñuel’s Films. Aesthetic mobility with “When loud Weather buffeted Naoshima A Sensory Walk”, “Chasing writers’ ghosts through a modern city: Augmenting urban space with literary connections during the Tove Jansson walk in Helsinki”, “Urban Walking—an Authentic Experience on Stage? The Post-heroic Flâneur under Observation” and ”Vandringer i mørket - hvad man ser når solen ikke forstyrrer”. Personal mobility with “First Steps from Walking to Cross-Country Skiing: A Material Interactional Perspective on Ephemeral Surfaces for Personal Mobility”. Global mobility with “Mirrored journeys Central American and African migrants walking in search of another life”, and finally walking as a research method with “The walking cure Walk-along som undersøgelsesmetode til brugeroplevelser”.